There are many challenges when being a long distance Mimi. Being a long distance Mimi trying to sew for the new baby is even more challenging. It involves lots of "FaceTime", pictures via text messages as well as trying to describe in words what you are wanting to do. It also involves trying to execute what Mommy describes she wants. It has helped to go window shopping while I was visiting to get a sense of what she likes and doesn't like. Pinterest is also helpful. 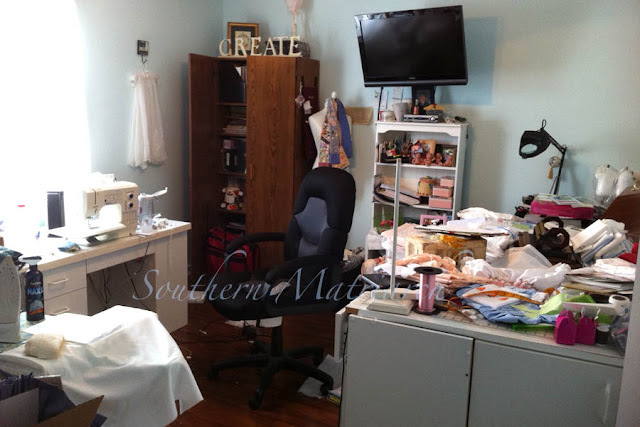 First step, bring some order to this disaster of a sewing room. I should have taken an after picture. It looks much better now. The fabric closet has been straightened up, everything put away and ordered restored. When it is clean I just want to sit in there and admire it. Alas, I won't get much sewing done that way. Even though the christening gown is breathing down my neck, we have to bring Baby H home before we can baptize him. So over the weekend I have been knocking out the embroidery on his coming home gown. Mommy went back and forth over whether she wanted a bubble or a gown. Gown was finally decided on. I am using Kathy Neal's Neal's Nightshirt. I have had this pattern for ages but never used it. It is very similar to a pattern I have about worn out and even bought a replacement copy. There is something about the offset front closure that speaks to me. It spoke to Mommy as well. 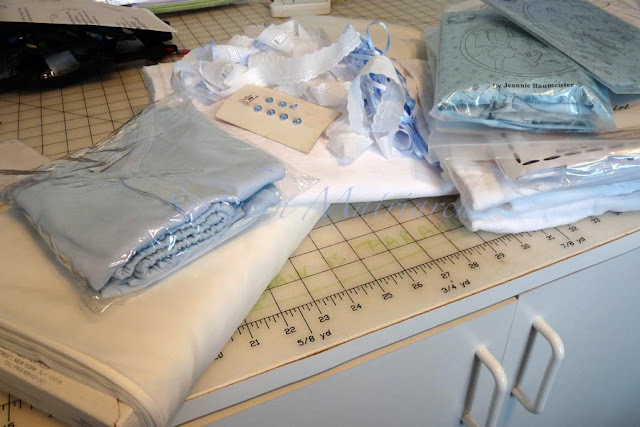 One of the challenges of long distance sewing is trying to describe in a common language what you are using and planning. I finally put together a couple of groupings to show Mommy the plan. This is the one she chose. 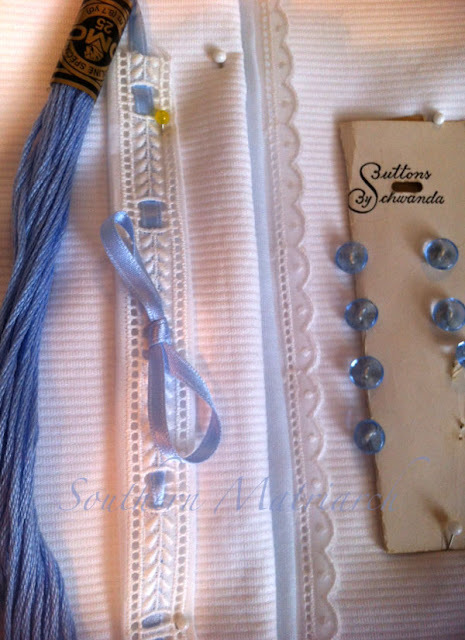 Skinny Dip pique, antique glass buttons, Swiss eyelet trims, blue fairy fabric for the piping, silk satin ribbon and embroidered with blue floss. Time is flying by, I am off to construct a sweet baby gown. Later, faithful reader. My grandbabies mother just wants a soft knit gown.. (rolling eyes). I love your choices. Great choice of pattern, fabric & trims, Amy definitely has her mother's eye. Get that machine humming mimi !! Yes, there is something especially nice about an offset front. 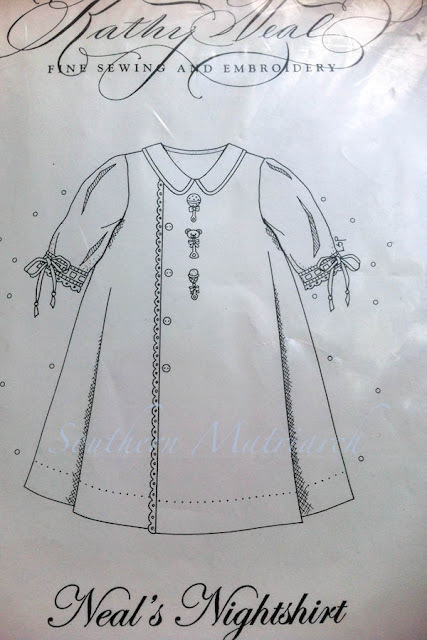 It is going to be so sweet, I just love the dark blue buttons. Fun to read how another long distance Mimi does the grandmother thing. Not as much fun as having them nearby, but I keep thinking about years ago when we REALLY wouldn't have seen or talked to them very much. Love all the new technology that makes it better. Martha, I am deeply honored that you chose to introduce your grandson to the world in my Neal's Nightshirt. Neal is now a grown man, middle school principal, and father to three children--two in high school! 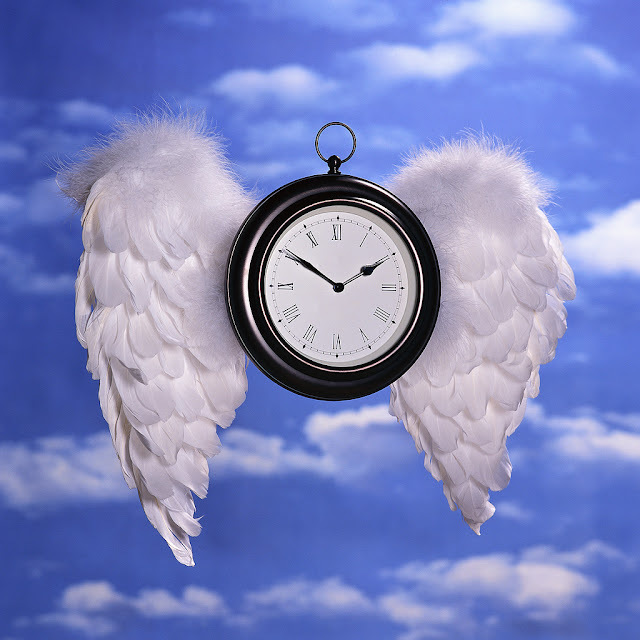 My how time flies.